If you're looking for a casual yet totally stylish getup, marry a black and white horizontal striped crew-neck sweater with a blue denim button skirt. Both garments are totally comfy and will look fabulous paired together. For shoes, make black leather ballerina shoes your footwear choice. If you don't like getting too predictable with your outfits, consider pairing an Ermanno Scervino striped knit sweater with navy skinny jeans. 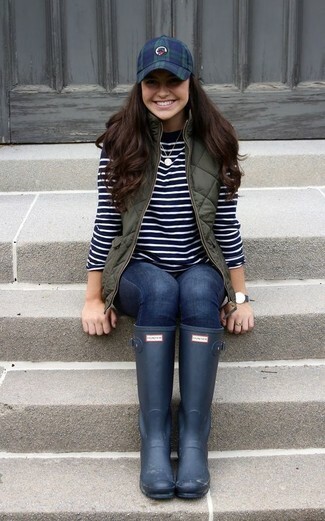 To bring out the fun side of you, complement your ensemble with navy rain boots. 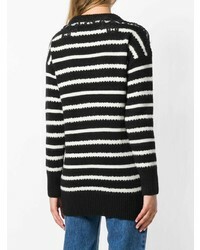 If it's comfort and ease that you're seeking in an outfit, rock a black and white horizontal striped crew-neck sweater with blue jeans. If you're on the lookout for a casual yet totally chic getup, opt for an Ermanno Scervino striped knit sweater and light blue flare jeans. Both pieces are totally comfy and will look fabulous paired together. If you're in search of a casual yet totally stylish outfit, rock a black and white horizontal striped crew-neck sweater with black leather skinny pants. Both garments are totally comfy and will look fabulous together. Choose a pair of navy low top sneakers to make the outfit current. 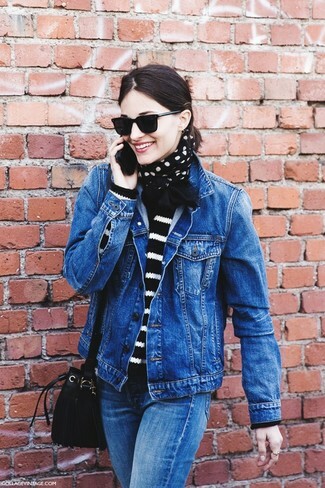 If you're searching for a casual yet chic ensemble, try teaming a black and white horizontal striped crew-neck sweater with black skinny jeans. Both pieces are totally comfy and will look fabulous together. Up the cool of your outfit by complementing it with tan suede ankle boots. 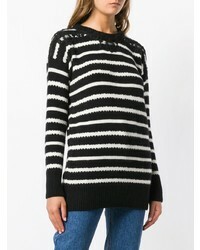 If you're obsessed with comfort dressing when it comes to your personal style, you'll love this stylish pairing of an Ermanno Scervino striped knit sweater from farfetch.com and a black mini skirt. Black suede ankle boots will instantly dress up even the laziest of looks. 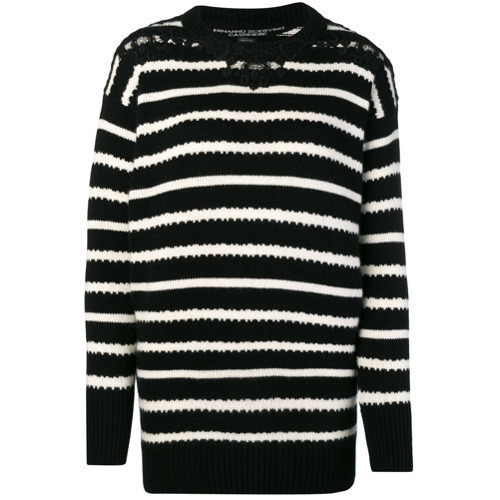 If you're scouting for a casual yet totally chic look, make an Ermanno Scervino striped knit sweater and black skinny jeans your outfit choice. Both pieces are totally comfy and will look fabulous paired together. When it comes to shoes, this look pairs nicely with black suede low top sneakers. If you're all about functionality dressing when it comes to fashion, you'll love this super cute combo of an Ermanno Scervino striped knit sweater and black ripped skinny jeans. Up the cool of your ensemble by completing it with black leather ankle boots.